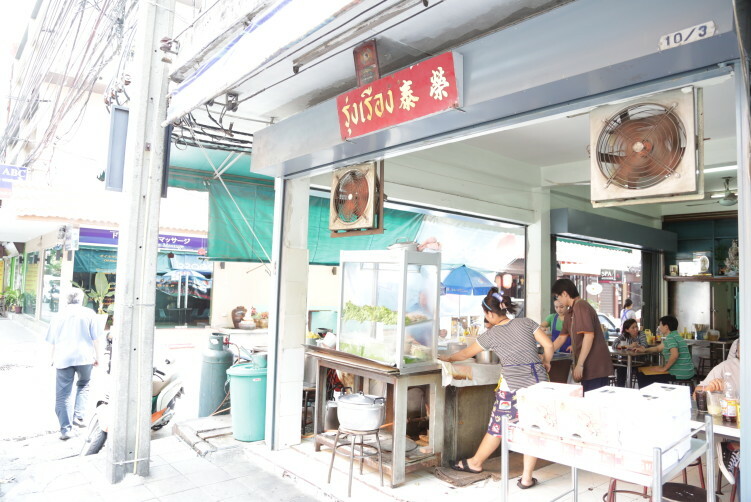 Once upon a time the two noodle stalls next to each other, 150 meters into Sukhumvit Soi 26, used to be one stand. When the original owner died, his two sons took over and expanded the place. Then they started a family quarrel, resulting in a wall being built between them. Both stalls is named Rungrueang, sometimes written Rung Ruang, but when somebody tell you that the one on the corner is the original and the other is a copy, you should take it with a smile as both stalls are based on the same recipes, made by their very same partens. Way back, the stalls have a Chinese heritage that also explains why the name of the stalls are written in Chinese. Today you would call it a Sino-Thai kitchen, a cross over kitchen. Anyway, the two shops have some of the best noodle in town. Their famous among locals, while most foreigners isn’t aware of these two pearls, unless they stay in the Hilton hotell next to it. Both of them offer a few dishes based on noodles, grounded pork, fish balls and liver. No matter what combination you choose, dry or with soup, it’s excellent food. The broth is really good, but of course, the condiments are there to be used for fine-tuning. Taste first and then see if you prefer to have it sweeter, more sour or spicier, but this is as far away form Knorer-cubes as it’s possible to get. The dry version (haeng) comes with a tom yum seasonings simply called “yum”. Deep fried fish skin for B20 is available as side dish. Both of the stalls are still family run business. The original one on the corner probably attracts those “in the know” as it was the first stall, but the other one also has the Shell Shuan Shim award. Honestly, you will have difficulties tasting the difference. 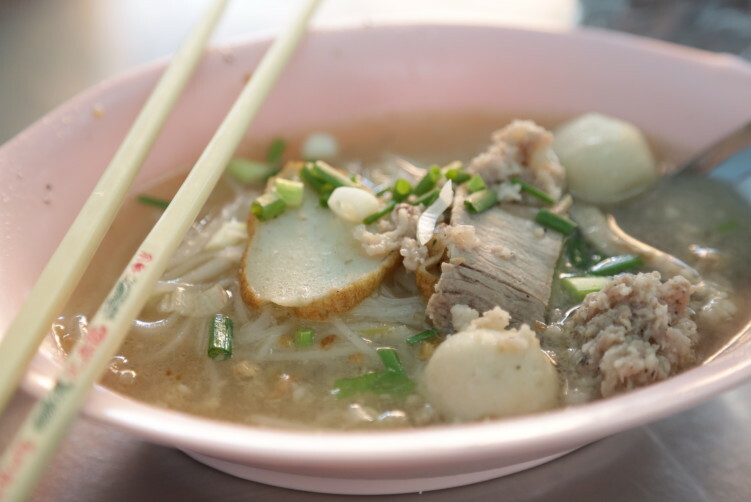 The pork broth is rich and flavorful and medium to full bodied to use the wine language. Also their add ons are really good, and not only the grounded pork and the fish balls (look chin pla), but also the entrails of liver. Don’t worry, they are well cleaned, but for those who don’t like entrails, you just need to say no inside and they will understand. But part of the reason for the very tasty and medium to full bodied broth is actually the entrails. The owner’s daughter speaks English in case you need help. The cliental are mostly middle class people as B40 (small), B50 (medium) and B60 (big) a bowl is considered a bit on the pricy side among Thai worker. They use the color of the same sized bowls to separate between regular and big portion. If ordering a regular, I’m pretty sure you will have a second bowl, as it’s a really tasty treat with perfect cooked noodles. You can choose different noodles, but personally I prefer sen lek. It translates into small noodles. When bought dry in the supermarked they are normally flat, but when freshly made as they are here at Rungrueang they are round. 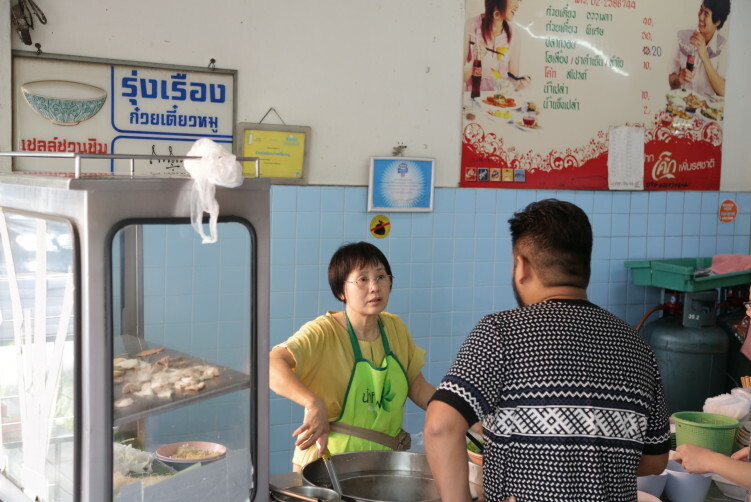 Both of the stalls uses their old family recipe in making them. They also have other options such as keam e, bamee and sen yai. They are all bouncingly chewy and perfectly cooked. Take the time to really feel the texture and taste when you’re here and use it as a reference when eating noodles elsewhere. Rungrueang Noodle House is a buzling place, with the usual wobbly metal tables and plastic chairs. 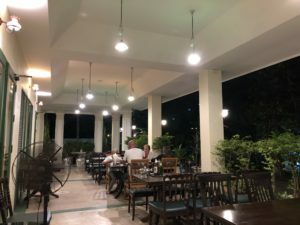 It get packed on weekends and lunch hours between 12am-1.30pm., but of course, the reason for all those locals flocking here is the quality of the food. Personally, I go here quite often for breakfast when in the area. Don’t be offended by the slurping, it’s actually the right way to eat it as it will enhance the flavors. The service is fast and the service is above the usual hole in the wall level. 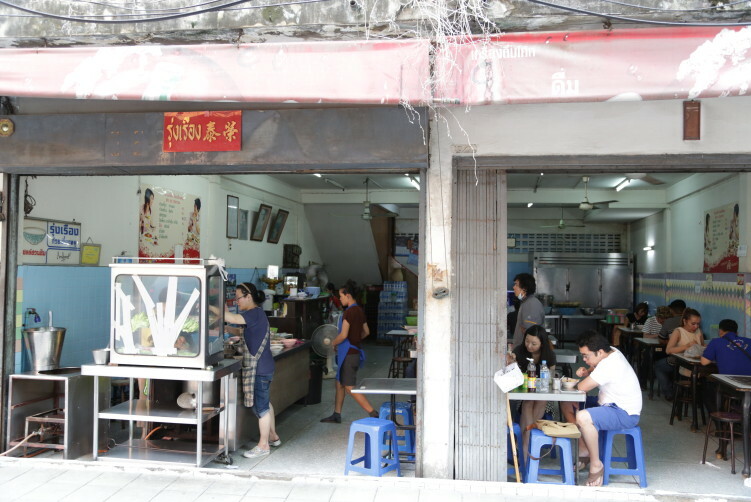 Rung Ruang Noodle House is not a resto you just stumble upon as it’s out of the ordinary tourist routes. That said, it’s only a short walk from BTS Phrom Phong station with Emporium Shopping Mall. website Name: Rungrueang (sometimes written Rung Ruang) Noodle House. The corner stall has an extension through the main kitchen into a section that seats another 30-40 people. order now Food: Noodles with grounded pork and fish balls ++. The have a photo menu to make it easer for foreigners. order now Price: B40 (small bowl), B50 (medium) and B60 (big). How to get there: Take BTS to Phrom Phong, then take exit 4 and walk towards Soi 26. Turn right into the Soi and continue for about 150 meters. You find it just before the Doubletree Hotel by Hilton. Ruangrueang (sometimes written Rung Rueng) serves great noodle dishes (broth or without) with fish balls, minced pork and entrails for the brave once. Homemade food all the way. One of the better noodles spots in Bangkok. See ull review at StreetsideBangkok.